Living simply has its complications. For me, one complication is that I have no toilet. I know its taboo to talk bathroom talk, but I think secretly everyone likes the subject. Its silly, stinky, and is accompanied by sounds that make me laugh. I had a toilet of sorts when I first purchased my boat, but I removed it with big plans of adding a plumbing system that would allow me to pump the waste overboard (only where it is legal to do so, of course) so I didn’t have to carry a holding tank of waste aboard my boat all the time. This would avoid the unnecessary, accidental malfunction resulting in a spillage that would inevitably happen at the worst time; when the boat is being tossed about by big seas. What would have started out as a small drip might quickly turn into a medium spray and then a large mess. So, I drilled a hole in the bottom of my boat. Little hole, big mistake. I couldn’t complete the plumbing project. So, one hole, several weeks, and lots of money later I went from an ok toilet that sort of worked but smelled bad to no toilet at all. After shedding some tears, arguing with a friend who was there to help me, and freaking out over my lost cat (who was temporarily on the loose, a fugitive from the construction his home was experiencing) I realized that, as always, there is a much simpler solution. Now I am on the search for the perfect bucket. It’s a great solution. By using a bucket, I can dispose of my waste overboard or in a shore toilet, whichever is appropriate at the time. But finding the right bucket is also complicated, and I have tested three so far. I need one with a sturdy handle and an excellent lid with a tight seal…probably one with a rubber gasket or screw top lid. I prefer buckets smaller than the standard 5 gallon “Homer Bucket” that you can find at Home Depot. 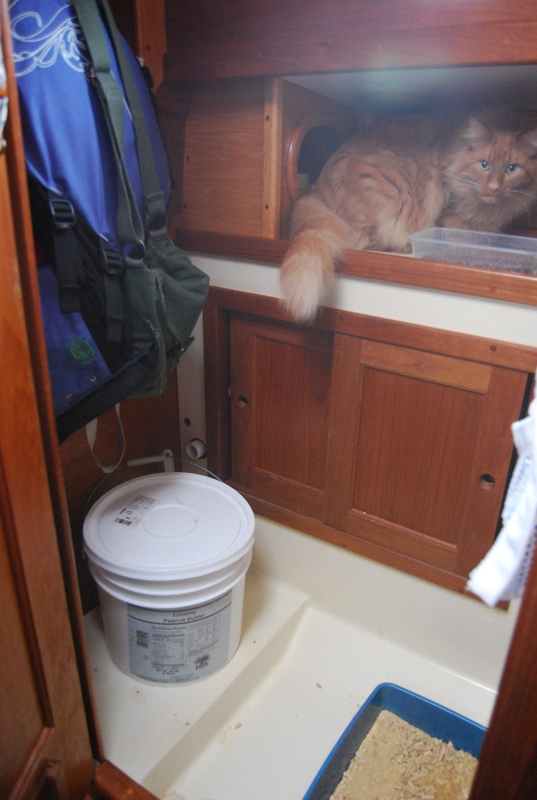 Although it seems small…my boat has limited space for a bucket and has to share the space with my cat’s litter box. If you know of such a bucket, please contact me. Have you thought about the AirHead composting toilet? It’s definitely more expensive than a bucket, but no holding tank, no smells (really! ), no hauling anything around, simple to install, and the fan runs on almost no power. Actually, I used it for a several weeks on my old boat with no fan with no discernible difference. It’s the first thing I’ll buy for my next boat. Try page 1672 of the McMaster-Carr catalog.1, 2, 3.5, and 5 gallon polyethylene round pails and 2 and 4 gallon polyethylene square pails, all with rubber-gasketed lids. 2 gallon (7.5 litre) should be fine. We used to have nine litre buckets on various boats, when I was growing up. I don’t think a bucket is the asnwer. But, if you think it is ? Go to Boatownerswarehouse.com Item #100218 Free shipping $27.28. My first boat I use a bucket. Got it at Wal-mart much cheaper. I checked on E-bay and found Thetford Marine Porta Potti 735 MSD Toilet Boat RV Head Item number: 360102549575 Buy it now $90.00 shipping $15.00. I suggest if you can to go this way. Either way use either be sure to use TOILET CHEMICALS. Instead of puting paper in bucket or toilet put it in a trash bag near by. Hope this helps you some. Ahoy Friend In Need , Different times need different solutions. There are times when “bucket and chuck it” is ok, but there are times, when it isn’t. When it isn’t I use the approach that doggie owners use,,,, just do it in a plastic bag and deposit it in a proper trash receptical. The West Marine bucket toilet seat, over double plastic bags, can catch all, for deposit, later . I use a lot of spray deoderizer, and recycled paper towels, in each batch, and not let anything stay onboard, for long. When in a city, do as they do , for their pets . Right now, I’m at a dock, so I use a shore head all the time. Its great! Ahoy Teresa, a last thought that I had, was that some “anchor-outs” , purchase a monthly membership at a local gym, so that they can use their facilities, and get exercise, at the same time, during their visits, all the while carrying their bikes for transport, in their dinghys, to shore and back. As an outward bound person, you must have been taught about what you pack in , pack it out, too, as so very many river kayakers are taught, these days. Thanks for the suggestions. I can assure you that I am careful to dispose of my waste properly. Recently I haven’t been using my bucket, but instead using the shore facilities. I also have bags designed for waste disposal that I can use too. So, there are lots of options. I hope none of you are worried that I am careless with my waste. That wasn’t what I wanted to portray with this post…just a thought. And perhaps someday I will save enough $ to get a different toilet and install it properly. Here’s a good link to composting toilets. http://www.letsgogreen.com/ They seem to me to be the best solution to the problem. Did you know that the state of Georgia requires you to maintain a log going back one year of your boat’s pumpouts. I wonder what they would say if you showed them your composting toilet and no pumpout entries, LOL? In Australia we have available a PortaPotty – many yachts on fresh water lakes and rivers use them. They are two piece chemical toilet that needs to be emptied ashore in fresh water areas. Try eBay. This link is to eBay Australia. Avoid the composting toilets. 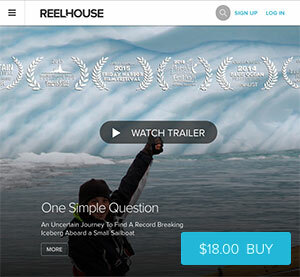 Its a great idea and for a casual boat user it would probably be ok… for day in and day out it doesnt work. I have done a good amount of reading on the subject and the smaller units dont have a separate area for the composting part… new stuff just keeps landing on top of old and it keeps it moist and wet. Im thinkin of stealing your idea and seeing if I can make a space for my cats toilet to share a room with my toilet… or teach hit to use the head lol. Deryk, I cut a hole in the door to the head for Dory to sneak through when he needed to go potty. Framed it with a piece of teak and it looks nice. Its become “Dory’s Room.” When the boat is healing to port, he runs in and gets cozy on the shelf! Before I moved onto my boat I began teaching Dory to go to the bathroom in the toilet. Its possible! But I decided it wasn’t the best solution for me. Back to the litter box. I see a ton of people who really give good advice about poop and poop related issues. Personally have a head and holding tank that was completely full when I purchased my boat. After a very interesting adventure out in 6 foot seas and everything getting stirred up, I had the boat pumped the next day. The amount of ballasting I lost from the tank being pumped required me to rethink my entire storage arrangement due to improper weight distribution, the boat had a nice lean to say the least. I personally use a Chlorine bucket with a nice lid on top. Swimming pool stores tend to have empty ones they will give you. I took a pool noodle and split it, wrapped it around the top and BOOM, nice soft seat that can be put on and off easily for booty comfort. 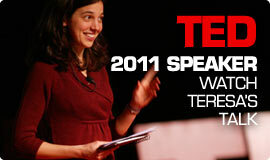 Hi Teresa, just stumbled onto your blog,good reading. I too lived on a boat all last year,blogged about it and can relate to many of your issues. I would say the toilet issue was my biggest headache on the boat.I had a Jabsco manual pump toilet when I got the boat that hardly ever worked, stank to high heaven and had the audacity to backfire into my face more than once. In desperation I have resorted to peeing off the dock in the middle of the night, peeing in my bathtub, using a bucket with plastic liners and finally installing an electric toilet. This is still not the answer as at the moment its still going overboard. I dont have room for a black tank and no where to pump out around here even if I did. I was thinking about trying a composting toilet next. Good luck with eveything, look forward to reading more of your adventures. As for plumbing the head, the way I have it setup on my boat is the head discharge line is plumbed directly into the holding tank. The holding tank pumpout line goes up to a diverter valve. One side of the diverter valve goes to the deck pumpout fitting. The other goes to a Henderson/Whale Mk. V diaphragm pump and then to a seacock and through-hull, that was previously used for the head direct discharge, and allows the holding tank to be pumped overboard when out past the three mile limit. 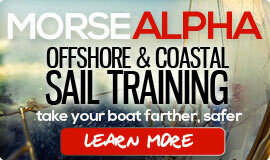 I know this is old thread on your blog, but, I still prefer the bucket method and I have been sailing for 21 years. As you can see from my boat pic, out went the engine and the head in a big pile http://www.annarke.com on my latest Tartan project. #1 – or “bright” – is not actually waste. Especially when it comes to self-sufficiency at sea. It’s food, water and medicine and, ALONE, could keep you not only alive but alive and WELL for a month or more. #2 can tell you when you should be drinking #1 – like a canary in a coal mine. “If it ain’t right, drink the bright” – and can be “deposited” on a flat, HDPE surface, (like a kitchen cutting sheet or board) tethered to the deck and either immediately picked up with a doggie waste bag or left in the sun to dry and then picked up. The HDPE surface (HDPE is that plastic that neither glue nor tape nor anything else will stick to) can be dropped into the water to soak and disinfect then pulled up, stored in a deck rack and allowed to air dry. And, of course, it can easily be used below deck for privacy. Bright can also be used externally – applied to the skin and allowed to dry with zero odor. Excellent for sunburn, sprains, bruises – anything external. And it isn’t at all like you imagine it. It tastes like mineral water and doesn’t stink unless it’s concentrated – i.e. extremely yellow which is usually a sign of dehydration but ALSO a sign of a problem and should be drank. You should only ever drink your own bright except in the case of something like some sort of system failure at which point you aren’t producing any of your own. IF necessary, the bright of others is best used externally unless rations have been depleted. The bright of others won’t hurt you but it also won’t do the job yours will. Bright is elemental. It’s like the elements of nutrition, already processed and, so, easily taken in and put straight to work by the body. And YOUR fresh bright contains the elements YOUR body is using -right now. The elements it NEEDS. Elements aren’t food. They are the RESULT of food. They are the product of your body’s food processing factory. They are the bits that do the work. They’re the bits that are IN food that the body digests and otherwise processes your food to GET. The elements in your urine are “ready to go” – no processing required – which is a good thing when something’s wrong because not only are you providing more of the elements the body actually needs and is using but you are also freeing the body from having to divide it’s energy between dealing with the problem AND processing food. Elements are not processed. They are either used or stored. To process them – to break them down into something MORE elemental – i.e. sub-atomic waves and particles – would require cold fusion. Bright is pure food PLUS fresh water.